Affordable Cool Roof Coatings; we will deliver superb work and help you save money year round. Super Therm Cool Roof and building coating is a really cool way to extend the life of your flat roof here in Colorado. It is a water-borne combination of high-performance urethanes and acrylics combined with resin additives producing a strong flexible coating that will repel water. The product is designed for durability and to perform for years. As much as 95% of solar heat entering a structure is blocked by Super Therm's 4 unique ceramics contained in the product its low permeability flexible membrane can hugely settle down the expansion and contraction of a roof. In addition, corrosion and surface deterioration will be prevented. The product can be applied to metal, concrete, wood and masonry by spray or brush and roller. Recent tests in Kansas revealed a 70% solar reflectance, which is really quite good since the Energy Star initial Solar Reflectance Index was 80%. Our experience tells us that typical solar resistance depreciation is 10 to 15% after 6 months. Super Therm's was merely 7% depreciation after 15 years for exceptional performance. This roof coating is a water proof reflective coating - part elastomeric hydrocarbon rubber compound (added ceramic pigment for strength). Before application, a thorough power washing of the roof's substrate (exposed surface) which may be TPO, EPDM, PVC, wood, concrete and/or metal, Cool Roof can then be applied with about 21 days for a set period. ​100% SILICONE - GacoRoof offers a unique chemistry for peace of mind for a lifetime! It outperforms acrylic, urethane, asphalt and Hypalon® and outlasts them all. NO PRIMER REQUIRED - GacoRoof adheres to most roofing surfaces without primer including BUR's, cap sheet, metal and modified bitumen. PERMANENTLY FLEXIBLE - GacoRoof stays flexible and maintains adhesion, even under permanent ponding of water or snow pack. Other coatings can become brittle and start to degrade over time. LONG LASTING IN SPITE OF ELEMENTS - GacoRoof is not affected by steady UV rays and extreme temperatures. COSTLY TEAR OFFS PREVENTION Re-coating your weathered roof with GacoRoof will extend the life of your roof, and you can avoid the time-consuming and costly tear offs. High performance urethane and elastomeric acrylics combine as a single component in a water borne formulation designed with state of the art elastomeric resin system giving long life and solid weathering, deals with water ponding resistance, and dirt release. This can be used as a more cost effective covering over most roof systems. Call for details. Commercial and industrial Super Therm Cool Roof products deserve their own page because it is truly a great product that can save you a ton of money over time with its reflective insulation ability. We make sure the roof is aggressively prepped and ready for Cool Roof application. If you are thinking about improving your heating costs and adding some years to the life of your roof, give us a call and we will give you the lowdown on this roof coatings system. When we plan a job involving potentially large square footage roof areas, we make doubly sure that we have everything planned, including full knowledge of the roof and any weak spots that may need a little extra repair, right down to the exact amount of product needed. On-going communication is something we take very seriously, you will always know where we are at. 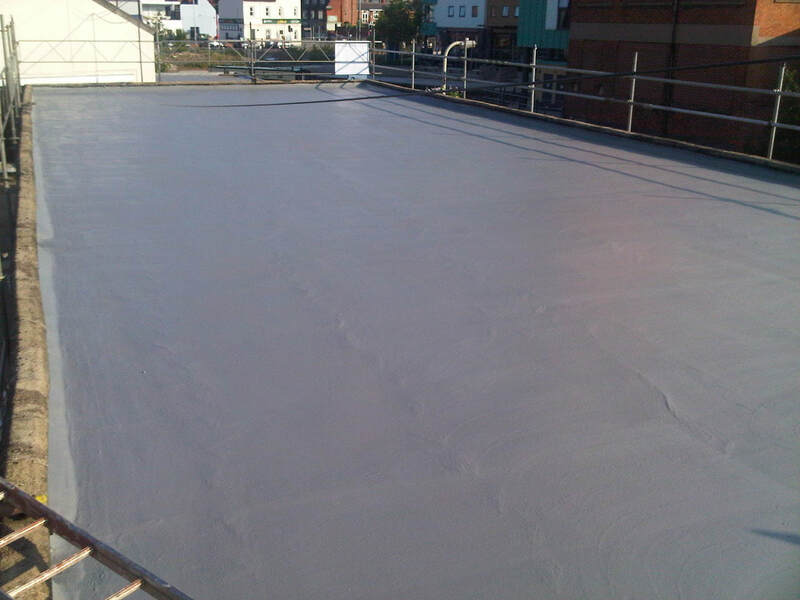 ​We feel that most types of flat roofs can be coated. Some examples to consider are metal and tin roofs, PVC roofs, polyurethane, single-ply, modified bitumen, Built-up roof (BUR) systems, etc. However, unless special treatments are done, certain types of roofs such as ballasted (gravel) surfaced membranes are not typically accepted roof surfaces for coating membranes. ​Major corporations around the world have applied Super Therm® to the exterior roofs and walls of their plants to insulate, weatherize, and protect them. The coating has a proven history of lowering energy use (HVAC) inside a structure by as much as 70%. Substantial savings on monthly energy costs are inevitable. We can look at a submitted picture to give you an idea of how to handle your roofing need.